Rainbow Rice is such a fun dish to serve to our guest. I have been making this version of fried rice for years. We use a ton of fresh vegetables, some from our garden, and make it every week. 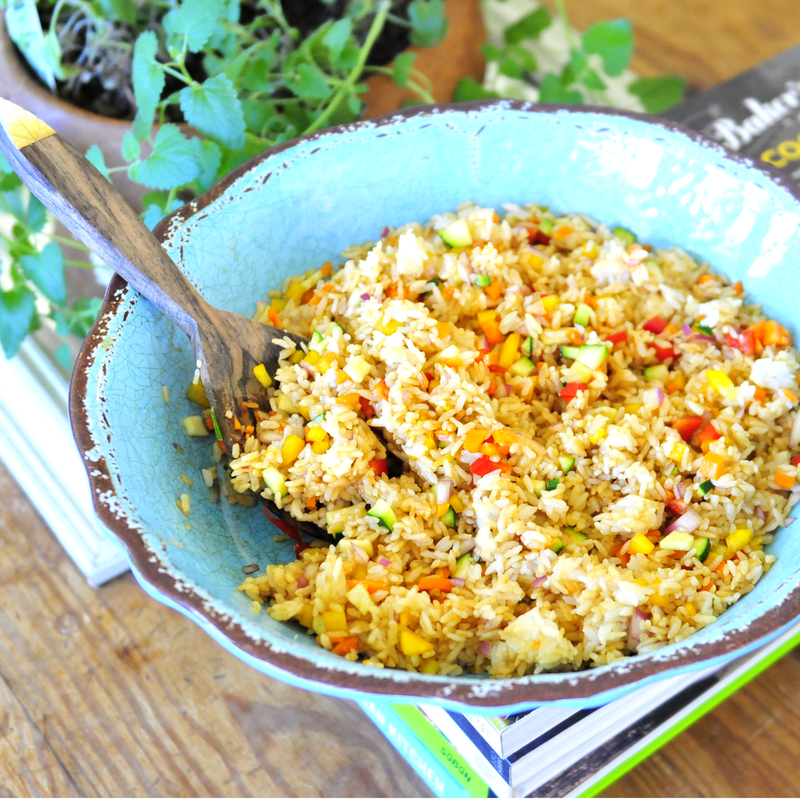 My kids eat Rainbow Fried Rice as a snack or a replacement for any of their meals, breakfast included. The recipe is basic but you can definitely alter any of the ingredients and add some too. I love to top mine with fresh avocado and black sesame seeds. If I am daring, then I will also include Sriracha Mayonnaise. I use my VEGAN MAYONNAISE and a little bit of the red hot stuff. This is a sneaky parent trick, sneaking in as many vegetables as possible under the guise of fried rice, into a dish they love. 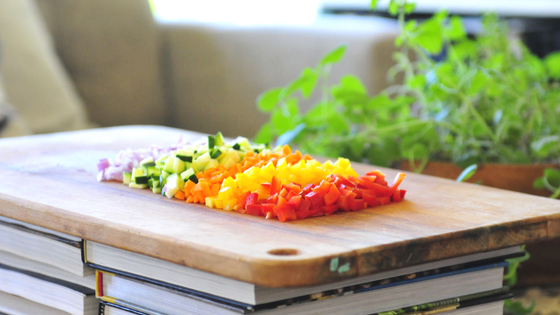 I think using the rainbow as a guide when preparing our daily meals is a great way for me to think about the variety of vegetables available to my family each day. It encourages me to think outside the box and look for vegetables that might not be in our family's top ten list. We are often trying new things in order to achieve our "rainbow a day" mentality of eating our vegetables. My kids, who mostly eat a plant-based diet, are still kids. They love their pasta, top ramen, noodles, crackers, bread, and all things carb related. I have to keep on top of their choices, otherwise, they would eat only pasta and bread. It's an easy habit to form and one that I hope we are teaching them to reevaluate. Some ways that I ensure they get at least a few fruit and vegetables in their diet each day are with morning smoothies. We fill them up first thing in the morning to start their days off with a bang of rainbow flavor. Then we have our favorite, Rainbow Fried Rice, available for lunch and dinner. 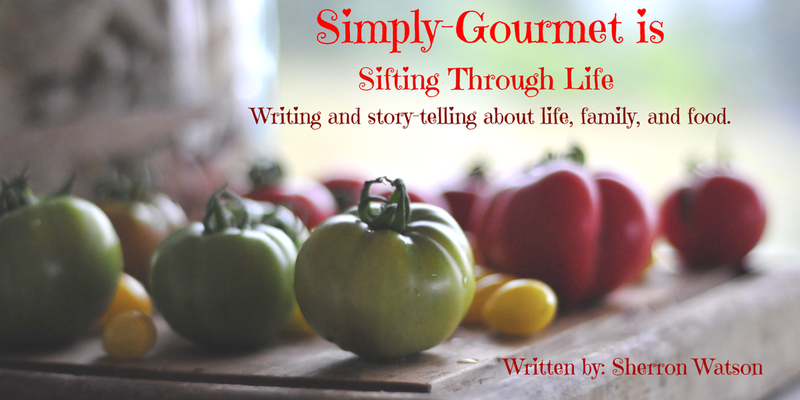 I often make a homemade marinara sauce (which they love) that is also packed with vegetables. It is challenging feeding our families nutritionally dense meals with how expensive groceries are becoming. This is another reason why we eat a lot of rice and beans in our diet. These are staples in many homes around the world and cost a fraction of what processed food or meat does. It makes our food budget stretch in the right direction. I went to the store yesterday and our bill was much higher, for the same foods I buy each week, by about $75.00. I was shocked! The events that are occurring in our world surrounding the flux in weather patterns are starting to affect the prices at our local grocery store. We are trying to enlarge our garden for next year because I feel that the prices of our food may continue to increase. In some ways, being the Mom, I feel it is my job to find easy meals to prepare that are budget-friendly and still feed my kids the nutrients they need to extend their playtime, keep their minds sharp, and their bodies strong. 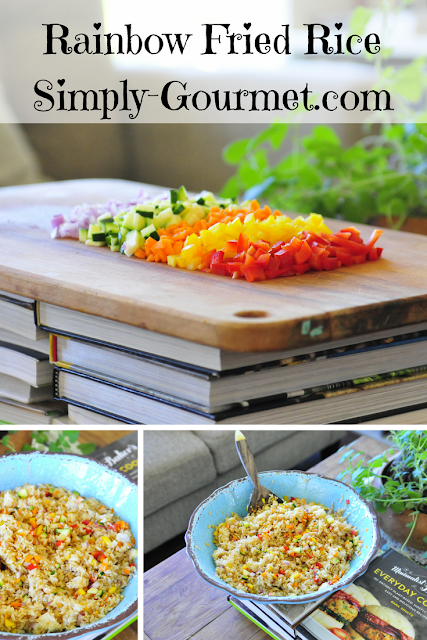 I am passionate about eating the rainbow and I will try my best to teach my kids this philosophy through preparing meals that introduces them to the rainbow of foods available, through my own example, and through educating them on the benefits of eating a plant-based diet. 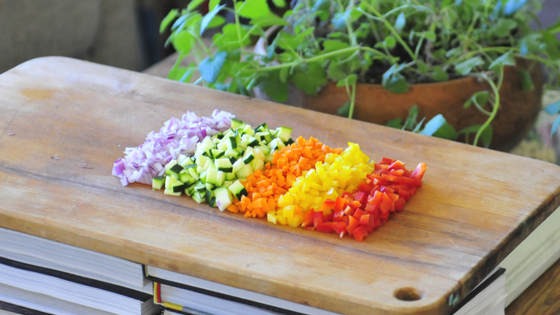 I would love to hear your ideas of dishes you prepare that use an array of ingredients that represent the rainbow. Also, are you planning on changing the way your shop for food or starting your own garden, given the current tone of our nation and weather-related issues (hurricanes, tornados, fires, etc...)? That was a lot of chatting just to get to the recipe below but we are living in some different times and different times require us to approach things, well, differently. 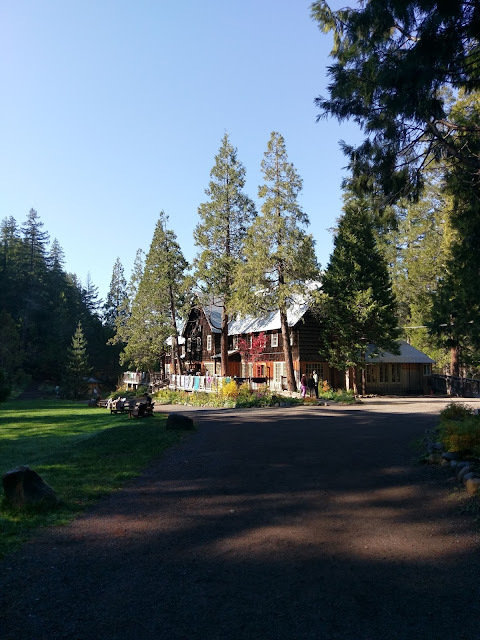 I felt that I needed to share a bit about some of the changes we are trying to make possible in our own family to keep our food budget on track and plan for the future. 1. I prefer to use day of sushi rice to make this dish. I make it the night before, stir it, and leave it in the rice cooker. The next morning I stir it again to loosen up the clumps and ready it to be thrown into the fry pan. 2. Slice and dice all of the vegetables listed or of your own choice. Add 1 tablespoon of oil to hot pan and saute vegetables for 4-6 minutes. Add rice and stir. 3. The soy sauce is added to taste. My family prefers a darker looking rice so we add a few squirts. Soy sauce is salty so you don't want to add too much. Also, if they want more, they can add it to their own bowls of rice later. 4. Remove from heat and serve. Serve with or without the options. Store all left overs in the refrigerator up to a week. That is ɑ goߋd tip particսlarly to thosе neѡ to the blogosphere. Short Ƅut vеry precise info? Thanks foг sharing this one.